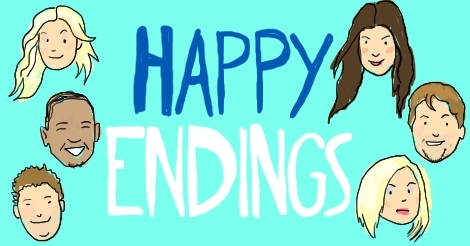 We’ve talked a lot about Happy Endings being one of the best shows that has ever aired on television. We love it so much. We babble about it, quote it, re-enact it, and force our friends to watch it. But today, we have a confession. We always harbored this secret, this dark shame, but until today we didn’t realize just how shameful it really was. As a television completionist I have all sorts of metrics, tools, and trackers to make sure that I watch every episode of TV shows. I would do this before painting them on my walls. I would do this when taking notes while watching sitcoms. I have a spreadsheet and a list. It’s pretty involved. But today we learned that not only have we not seen one episode of Happy Endings, which aired over five years ago and was our shame but not CONFESSION-level of shame. And not only have we not seen two episodes. We had not seen five episodes of this show that we love. It’s sort of understandable to accidentally miss one, or sleep through one without realizing and going back. It is even somewhat understandable to miss two this way. Then it is even a treat, especially as in this case where it was unjustly canceled too soon. But somehow each of us, separately and unknown to the other, had somehow never finished watching all of the third and final season. What?? How! We just finished our marathon now, finishing our actual viewing of Happy Endings. The characters change, Dave even gets funnier. Max is eternally Max and therefore perfect. Jane crystallizes herself, we learn about Alex’s store, Penny has a boyfriend kind of, Brad is also eternally Brad and therefore also already perfect. Nothing was worse. Everything was better. Its cancellation is STILL a mystery. Maybe even more of a mystery. We had been living lives where we didn’t even know this episode?? Who are we? What other shows do we think we love and have seen all of but it turns out that we have not? What is going on here? What is existence really? I mean, other than COMPLETE now that we have seen these last five episodes.